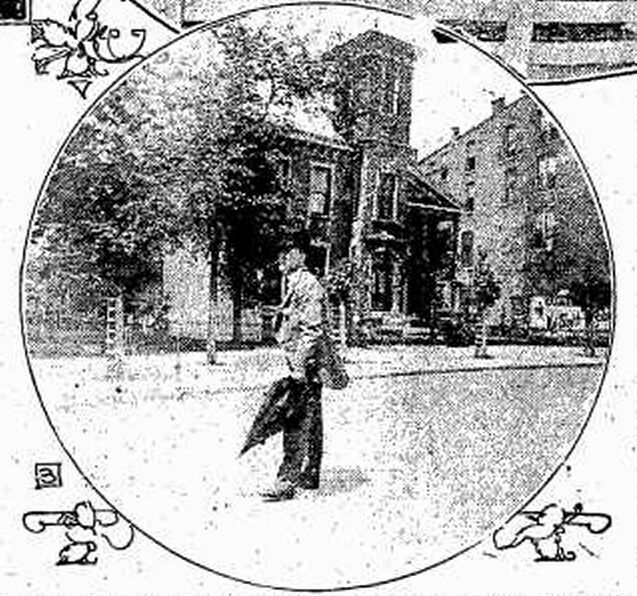 William E. continues: “At that time the entire site of the present Hotel English and opera house block extending from the corner occupied by this old church building to the northwest segment of the Circle and Meridian street, was occupied by this church and by three residences with large yards. The first of these next to the church was that of my father, next came the handsome home of James H. McKernan, and on the corner of Meridian street stood a very old one-story brick house said to have been originally built by Mr. Quarles, one of the leading lawyers of the city’s early period. Plymouth Congregational Church stood just around the corner on Meridian street, a few feet from the Circle, the old walls of which, on the alley, were later incorporated in the present Hotel English building.” He neglected to mention the old Bishop Edward R. Ames home, which by 1880 was an empty lot west of the Quarles home. The hotel was built in two sections around the opera house. 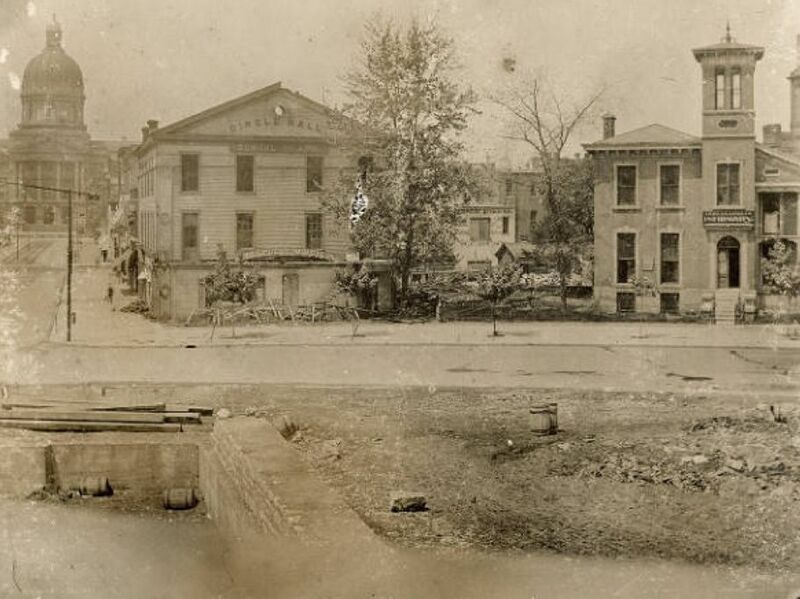 In 1884 the first section was constructed northeast to Meridian Street. 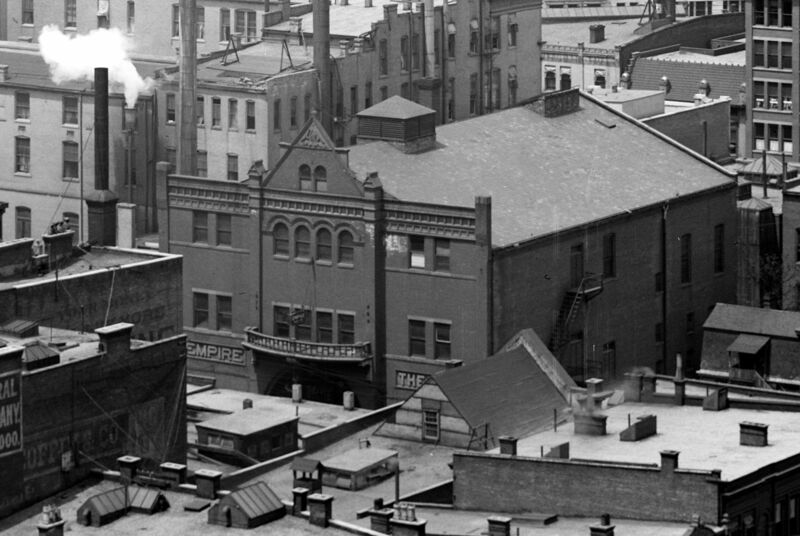 The second section, completed in 1896, expanded the building south to Market Street and required the removal of the old English mansion and Circle Hall. 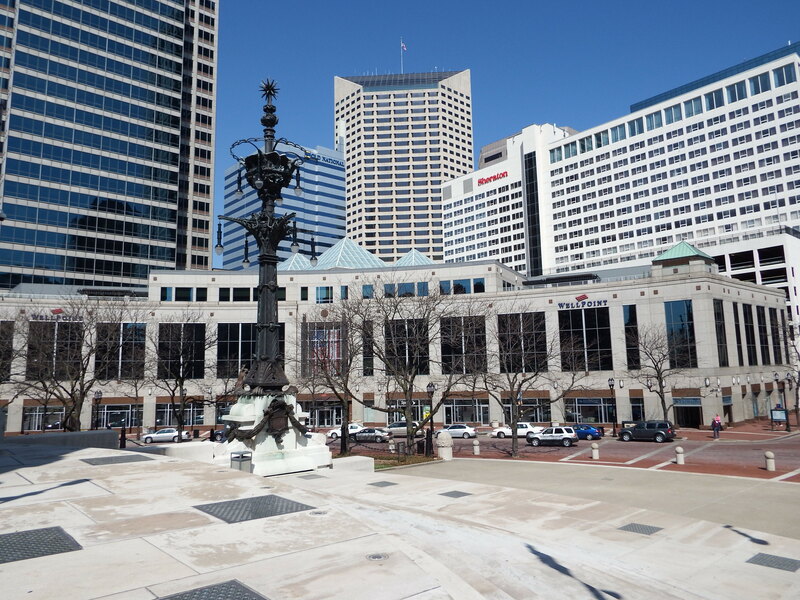 A large balcony added in 1910 was a popular location for politicians to address large crowds on Monument Circle. 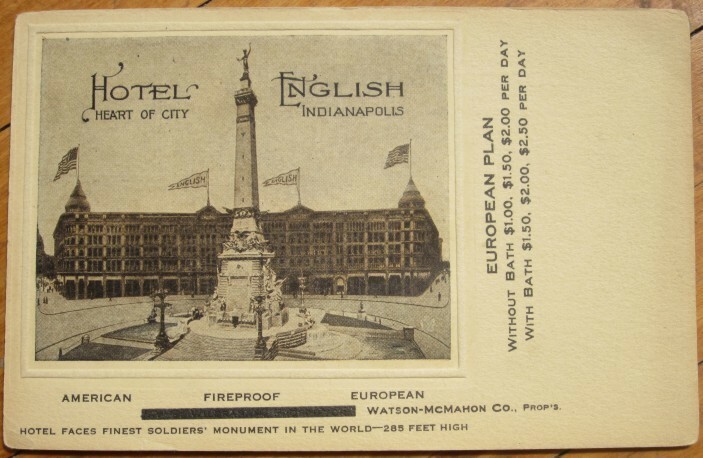 Many more photographs of the English Hotel and Opera House can be seen in the online collections of the Indiana Historical Society. Other views of the J. C. Penney Co. building can be seen in the Bass Photo Company Collection at the Indiana Historical Society. Photo courtesy of Tammi Burns. Hmmm….will future preservationists fight to save examples of our bland postmodern buildings and chastise our generation for not appreciating them? Nah. Linda: I did a quick spot check in city directories and in 1873 and 1879 Stephen Mattler was proprietor of the Union House; in 1881 his occupation was listed as “Saloon English Opera House,” in 1887 he was proprietor of the Occidental Hotel Bar; in 1897 it simply listed “saloon” as occupation; no occupation listed in 1901. He never owned the Opera House, but likely managed the saloon for the English family. Thank you so very much for your response. I regret all those typos. I am not savvy with tech skills and computers. Are there any existing photos of old homes of the first block of N West Street from 1890? 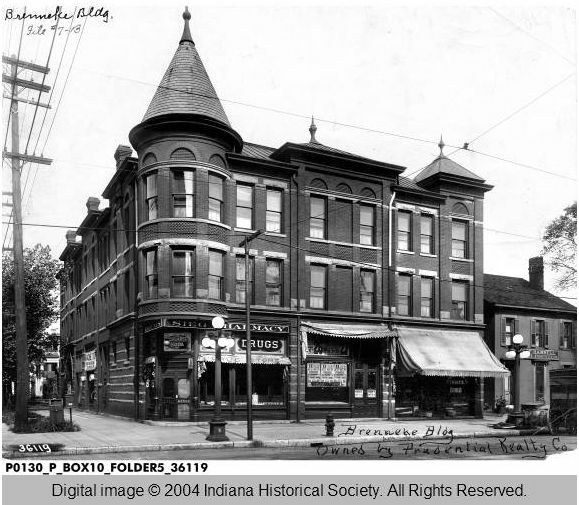 Also looking for photos of old mansions in the 2200-2600 blocks of N Meridian. I have learned much more about my husband’s ancestry since my previous request of 2012- even maybe a few tech skills! Stephen Mattler lived at 38 N West St. His daughter married attorney Henry Warrum, attorney from Greenfield and they lived in the area of 2200-2600 N Meridian. Another family member was J P Mullally (his wife was a Mattler). Unfortunately all those old homes are gone. I know that is in the area of the Old Children’s Museum. So wish I could find photos. Thank you. 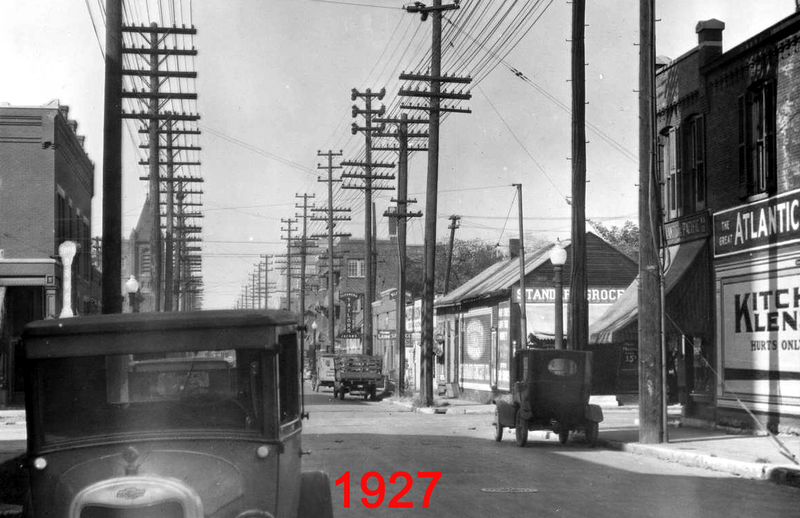 You might also want to look at http://www.whatwasthere.com which has many local photos oriented via map. And be patient, it takes awhile to load! 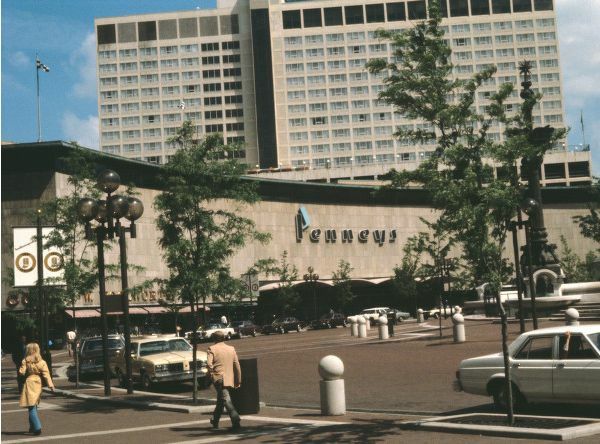 In between it being JC Penneys and WellPoint; There was a black glass exterior put on the whole building. 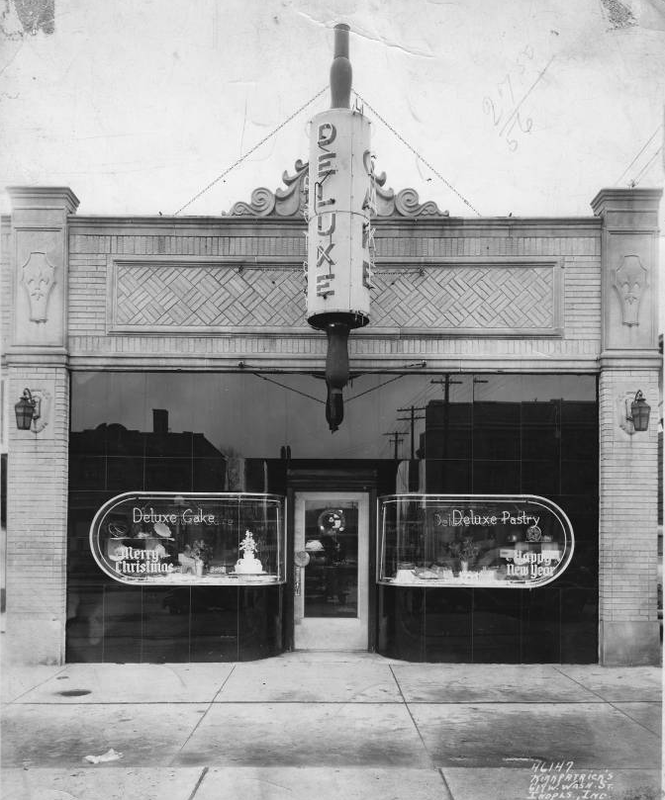 Do you have any pictures of when it had that modernistic black glass reflective exterior. I believe it was supposed to reflect the monument. Thanks Joan. And I really liked your comment about the Darth Vader Building! You can find out more about the William E. English’s legacy in Indianapolis by reading about the English Foundation, which provides below-market-rate office and program space for non-profit social service organizations that serve Indianapolis residents. Currently, several local nonprofits are housed in the foundation’s English Building, including the Arthritis Foundation, Indiana Chapter; Day Nursery Association; Family Service of Central Indiana; Happy Hollow Children’s Camp, Inc.; Indianapolis Parks Foundation; Lacy Leadership Association (LLA); and YMCA of Greater Indianapolis, Inc.
Great piece! 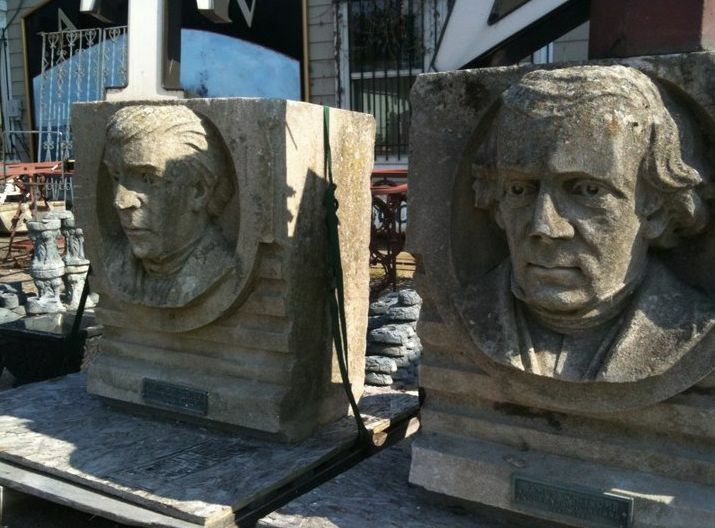 We still have the limestone busts. Hi There was a couple by the names of Doc Garrett and Emma Garrett who had something to do with the English. can you elaberate? I beleave I have in my possetion the clock that was on the mantle as you walked into the lobby. 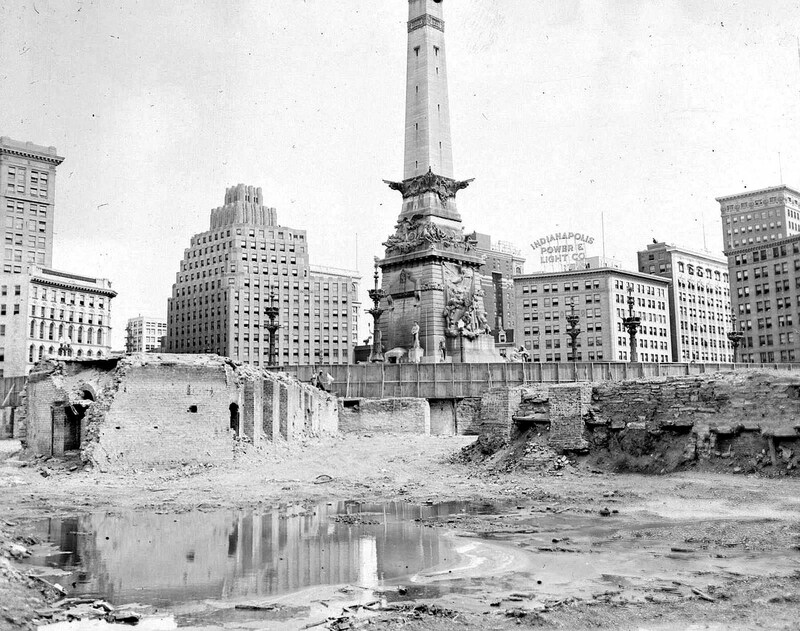 Indianapolis still has the monument left over from the 1902 era, but didn’t save the historic buildings that went with it, therefore Monument Circle lost much of it’s greatness to Modernism, thus I’m in agreement with the following statement. 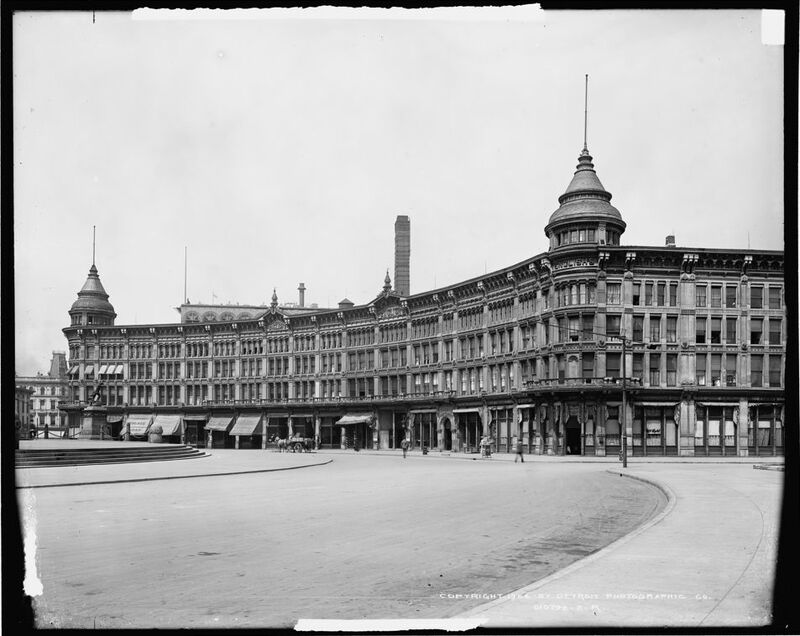 ” The English Hotel and Opera House is often lamented as one of the biggest preservation losses in Indianapolis history.” Amen. I was born in 1947 so I don’t remember the English Hotel. My mom was born in 1928 so she remembered it well. She complained about them tearing it down until the day she died in 1995. It’s strange that we lived on English Ave. Was it named after the same people as the Hotel? The Penney’s building is my favorite, then the English Hotel, then the Darth Vader building, then lastly the current WellPoint. I also hope future generations will not fight to save Indianapolis’s bland postmodern structures. The Chase Tower is the worst. Blah. Elisha Gale English, father to William H. English was brother to my 5 generation grandfather Joseph English born in 1790 in Green County, Kentucky. My great, great grandmother is Mary Scott English of Greensburg, IN. I am very proud of my family heritage.